Despite all the chaos and uncertainty in the world, you can at least take comfort in the fact that restaurants entirely dedicated to foods like bacon, egg, and cheese sandwiches and nachos exist. 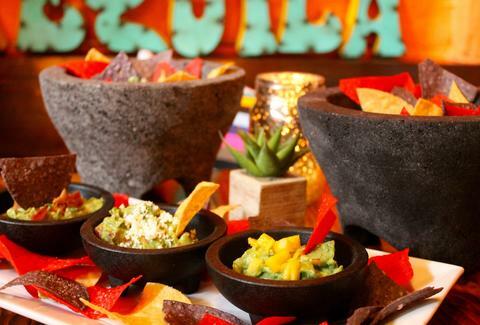 And now, America is finally being blessed with a restaurant that's almost entirely devoted to what's arguably your tortilla chips' greatest companion: guacamole. The new restaurant, aptly called Guac Tacos + Tequila, is set to open at 4pm on National Guacamole Day and Mexican Independence Day -- this Friday, September 16th -- in NYC's East Village. Just as its name suggests, the eatery boasts a menu loaded with various types of guacamole, tacos, other Mexican dishes, and tequila -- but mostly guacamole. Eleven unique varieties of guacamole, that is. 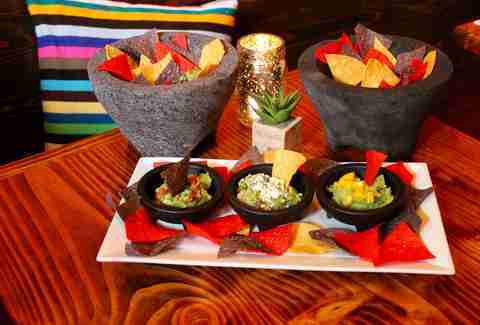 Along with traditional guacamole flavors like Tradicional Guac or Queso Fresco, the restaurant's expansive namesake dip menu also includes flavors like Smoke Chiptole, Fried Golden Bacon, and Exotic Mango, according to a press release. Translation: you're gonna need a shitload of chips. Best of all, the place also serves Guac Nachos, because that's simply what the guacamole gods intended, folks. You can also order tacos (filled with steak, chicken, and shrimp) and bigger plates like the Guac Sizzle Fajita, Carnitas Fritas Yucatecas, and Carne Asada Tamiquena, among others. As for the tequila menu, you'll find almost as many options as there are guac flavors with 10 types of tequila total. And, yes, there are plenty of margaritas to choose from, too. So, if you see crowds of people lining up near 179 Avenue B between 11th and 12th streets in the East Village on Friday, don't worry, it's not the insane iPhone 7 line at an Apple store. People just really love guac. Tony Merevick is Cities News Editor at Thrillist and is experiencing some insane guacamole cravings now. Send news tips to news@thrillist.com and follow him on Twitter @tonymerevick.